Oh you mean the "Prince of Darkness" Lucas Electrics?.. Or worse yet Miller? hahaha, I could not recall the names....you're good! Well, I couldn't resist putting these values in a spreadsheet to try to determine the best one based on DarenN's testing. I've compared the results of each stove against the slowest blooming, slowest boiling, and longest burn time stoves, and also the burn time remaining after boiling. The higher score means a better stove. If you want to download the excel file and configure it to suit you, the link is below. The percentages can be changed to what you determine to be the most important to you. 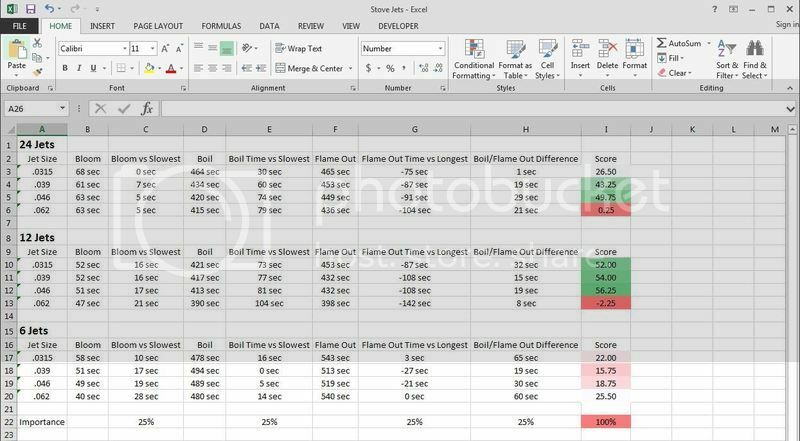 If you don't care about the bloom time or remaining burn time, then set them to 0% and the other two to 50%. I've configured it a dozen different ways, and 12 jets usually wins, and of those, 0.046 usually edges out all of them.